Shanxi province, right in the centre of the Loess Plateau and middle reaches of the Yellow River, is known as the “hometown of coal”. It is also rich in iron, copper and aluminum and supports an economy dominated by heavy, chemical and energy industries. Like Hebei, Shanxi is also considered one of the birthplaces of Chinese civilization. It was home to the Jin State, one of most powerful states during the Spring and Autumn Period of 11th century BC. During World War II, Shanxi was a revolutionary base, where the Chinese Eighth Route Army set up camp. This prestigious history, coupled with its varied topography, has left Shanxi with a rich cultural heritage. Famous sites and relics are scattered throughout the province. UNESCO has named several destinations in Shanxi as World Heritage Sites. 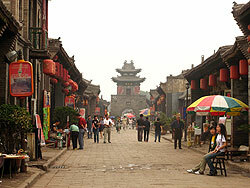 One such site is the ancient walled city of Pingyao. A great financial centre during the Qing Dynasty, Pingyao is noted for preserving the architecture, cultures and way of life of the Qing and Ming Dynasties. Another popular site is the World Heritage Site of the Yungang Grottoes. These ancient Buddhist temples date back to 460 AD, and are well known for their reliefs and sculptures carved from cave walls. Shanxi hosts numerous ethnicities, including the Hui, Man, Mongolian, Korean, and Zang nationalities and minorities.